For many who struggle with food, mindful eating alone is not the answer. 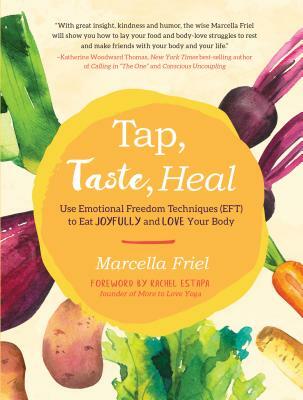 In Tap, Taste, Heal, natural foods chef and mindful eating mentor Marcella Friel teaches you the neurological repatterning tool of Tapping (also known as Emotional Freedom Techniques or EFT) to help you resolve the traumas that have caused you to reach for those foods you hate to love to eat. Let Friel’s step-by-step Tapping instructions and links to online Tapping demonstrations take you deeper than weight loss and help you accept, honor, and nourish your entire being, whatever the number on the scale. MARCELLA FRIEL is a natural foods chef and mindful eating mentor who helps health-conscious women love and forgive themselves, their food, and their figure. Friel’s writing can be found in Elephant Journal, The Tapping Solution Blog, and elsewhere. Her online courses, "Lose Emotional & Physical Weight with Tapping" and “21 Tapping Meditations for Emotional Eating and Beyond,” are top-forty best sellers on DailyOM. Known for her playful humor, laser-like insight, and deep kindness, Friel's ability to guide women through their healing process comes directly from her three decades of Buddhist meditation practice, twenty-plus years of 12-Step recovery, and nearly ten years as a client and practitioner of Tapping (also called EFT). Friel is certified in EFT through Tapping the Matrix Academy in Santa Rosa, California. "With great insight, kindness and humor, the wise Marcella Friel will show you how to lay your food and body-love struggles to rest."